Microsoft is warning Windows Vista users that a forthcoming service pack for the operating system may stop some third-party programs working. The software giant has released a list of programs that may be broken by the SP1 update for Vista. Most of the software hit by the upgrade are security programs that prevent Windows users falling prey to viruses, trojans and booby-trapped webpages. 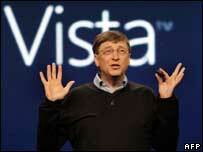 The Windows Vista update will be released to the public in mid-March. Service Packs are among the biggest updates Microsoft issues for its various operating systems. The software firm said SP1 makes Vista more secure and reliable and introduces some new features. The list of programs affected by SP1 is divided into three. Some will be blocked by the update, some will not run and others will lose some of their functions. Of the 12 programs mentioned, six block viruses or keep an eye on the places someone visits online. Microsoft warned that its list was not “comprehensive” and asked people to get in touch with the maker of any affected software to fix problems. Although the update will become widely available in March, Microsoft is releasing it to business customers in February. Microsoft has also been forced to withdraw an update to Vista that was required before Service Pack 1 could be applied. Writing on the Windows Vista blog, Nick White, Microsoft product manager, said the company had withdrawn the preparatory update while it investigated. Isolated reports suggest that some machines on which the preliminary update has been applied go into an update loop. Ok, I wanted to remove a program from my pc that runs on Windows XP but I came across a problem: I went to the Update / Remove application via the Control Panel but no programs would be listed and no error message would get displayed. There are some programs that you could download to replace Windows application but before check the registry has not been altered. If it has and you have a back-up of the registry keys then do as I did and use the back-up and everything should go back to normal. Also before doing anything it is wise to stop any scanning applications that might be going on at the time you went to the update / remove program. Just because Windows XP has the Add/Remove Programs feature it doesn’t mean your application will appear in the list. Furthermore, even if it does appear, it’s no guarantee that the uninstall feature will work. When you run across one of these situations the items listed below will help in getting rid of the application. Be aware that these steps may not remove everything associated with the application and can impact other applications on the computer. Have a backup or restore point and use caution. Find the directory for the application and delete all the files in the directory. Delete the directory. Open regedit and navigate to HKEY_LOCAL_MACHINE\SOFTWARE and find the folder for the application. Delete the folder. Open regedit and navigate to HKEY_CURRENT_USER\SOFTWARE and find the folder for the application. Delete the folder. To remove the application entry from Add/Remove Programs (if present) open regedit and navigate to HKEY_LOCAL_MACHINE\SOFTWARE\Microsoft\Windows\CurrentVersion\Uninstall and find the folder for the application. Delete the folder. Some applications have Services attached to them. If this is the case, navigate to HKEY_LOCAL_MACHINE\System\CurrentControlSet\Services, locate and delete the service. C:\Documents and Settings\All Users\Start Menu\Programs and delete relevant entries. C:\Documents and Settings\All Users\Start Menu\Programs\Startup and delete relevant entries. C:\Documents and Settings\%YourUserID%\Start Menu\Programs and delete relevant entries. C:\Documents and Settings\%YourUserID%\Start Menu\Programs\Startup and delete relevant entries. Click on the start button, click run. then type in “C:\WINDOWS\system32\Restore\rstrui.exe” choose a date when your add/remove programs control panel worked. hope it helps. This problem may occur if the uninstaller for a program incorrectly removes registry entries that are used by Windows and the Add/Remove Programs tool. 1. Click Start, click Run, and then type CMD. 2. At the prompt, type REGSVR32 APPWIZ.CPL. 3. If this fails, look for the registry entries that are listed below. To resolve this issue, check the registry for the following keys and values. Re-create any missing keys or values. Note that these keys use the system drive letter. You may have to adjust these entries to match the configuration of your computer. 4. Follow the steps in one of the following procedures, as it applies to your computer, and then test to determine if this issue is resolved. If the issue is resolved, skip the remaining steps. If the issue is not resolved, go to step 5. Because this command is case sensitive, Microsoft recommends that you copy the command from this article, and then paste the command in the Open box. Note Before you perform an in-place upgrade, make sure that you back up your data. For more information about the risks of performing an in-uplace upgrade, see the “More Information” section. a. Run Winnt32.exe from the \I386 directory on the Windows 2000 installation CD-ROM. b. When the Windows 2000 Setup screen appears, click Upgrade to Windows 2000.
c. Allow installation to complete. Note If the previous registry keys are blank, the Add/Remove Programs tool may also be blank. If this registry key is missing, copy the following text to a text file, save the file with a .reg extension, and then double-click the file on the affected computer to return the proper entries. Microsoft has confirmed that this is a problem in the Microsoft products that are listed in the “Applies to” section. The following list includes all the registry keys that are used by Add/Remove Programs. These keys must be set by registering Appwiz.cpl, but they are provided here for cross-reference to confirm that the registration completed successfully. Note This key is only available in Microsoft Windows XP. Registry entries that are used once ARP is running. Set to 1 while ARP is running. Tells TS that ARP is running. Set to 0 when ARP exits. Reads to determine if wx86 is enabled. Enumerated to obtain list of “new-link” handlers. It looks like these handlers may add a link for a given item – for instance, to the Start menu, desktop, or other items. Read to determine if a restart is required after running setup. Presence of value means must-reboot == true.